Gerald is joined by Paul (Varmints), Chris (Gravity Beard) & Amanda (Amanda’s Picture Show A-Go-Go) to countdown and compare our Top 5 Movie Soundtracks from the 1990s! Whether you’re in drag or your old flannel button-up, you’ll enjoy this one. Check it out! 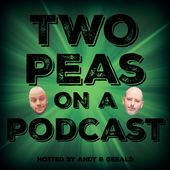 90s soundtracks amandas picture show Blazing Caribou Studios Gravity Beard Two peas on a podcast Varmints!